Rulers and ruler racks can make or break a quilting project, as they are the tools that help you ensure a high level of accuracy when working on one. While you would use a ruler for taking measurements and cutting the fabric, you would need a ruler grip to hold the ruler in place so that you can get accurate cuts. A ruler rack is something that stores all your rulers in an organized way, allowing you to find the ruler you need without wasting any time. So without further ado, here are 5 of the rulers/ruler grips/ruler racks for quilting. If you have been using quilting rulers without any ruler racks or non-slip grips, you know how much of a hassle it is. It’s very hard to get accurate results with a good non-slip grip, and even harder when you’re trying to figure out how to sew a straight line as a beginner. And many of the customers that bought the Crafters Workshop TrueCut were dealing with these issues, but were pleasantly surprised with the difference it made right after starting to use it. 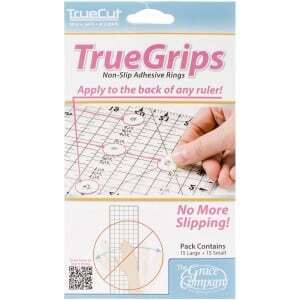 The TrueCut is very easy to apply, making it a great choice for those that will be using quilting rulers non-slip grips with their quilt rulers for the first time. However, the ease of use doesn’t come with any kind of compromise on the accuracy. The TrueCut is very transparent, so much so that sometimes you may have to find where exactly it’s placed. And this means that it won’t impair your visibility when you’re working on a project, which would help you get perfectly accurate cuts with your quilters rulers. Also, unlike some of the other ruler racks on the market, these are really thin and don’t make your rulers feel bulky when you’re using them, even if they are acrylic rulers for quilting that can turn out to be a bit heavier than the other types of rulers for quilting. Despite this, however, it manages to stick really well to a quilt ruler, as well as holds it in place surprisingly well. However, the grip is just right, and you will be able to adjust the quilting ruler slightly if you need to, although the ruler doesn’t move when you’re using it. First of all, we really like the fact that it’s very easy to use, yet manages to serve its purpose really well. The grip is good enough to not make you press down the ruler much when using it for cutting fabrics, but you still have some flexibility that allows you to adjust it a bit if you need to. This is something that would work really well for people that don’t have a sewing desk, although it’s a good idea to get one. Similarly, it would work just as well for cutting fabrics regardless of whether you’re cutting a quilting fabric or a sewing fabric. 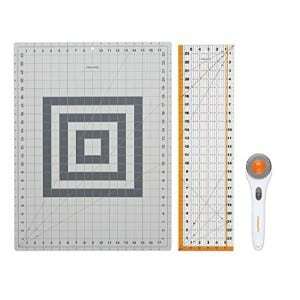 Just like different sewing essentials, the Fiskars 95237097J can be an important component of your quilting supplies. This sewing cutting set will take so much challenge out of your usual quilting projects. The set comes with one of the best quilting rotary cutters you will ever find in this price range. It’s sharp and powerful enough to cut through several layers of fabric, and yet delivers very clean cuts that don’t leave your quilting fabric with jagged edges or cut marks. It works surprisingly well on both thin and thick fabrics, including even something like the upholstery fabric. While its blade isn’t the sharpest you will find, it’s very durable. So even if you’re cutting something that’s very thick and strong, using it several times over it will get the job done without causing any damage to the blade. That said, some customers do choose to get one of the sharper quilting rotary cutter blades for improved cutting efficiency. Then there’s the ruler which looks more like one of those specialty quilting rulers out there, which are way more expensive. Measuring your fabrics will become easier than ever with it, even without using other tools like quilting pins. It can be a bit of a hassle to use for some of the thicker fabric assortments though, so if thicker fabrics is what you will be using most of the time, it makes sense to go for another ruler. Finally, the Fiskars cutting mat. While you may find better quilting cutting mats if you’re willing to pay more, the Fiskars cutting mat is pretty impressive at this price. It’s double-sided making it very easy to read the measurements. It’s also fairly sturdy and holds up well to all the cuts it’s subjected to. Overall, this is a great value for money cutting set that should be a great option for someone on a very tight budget. The price is the best thing about this product. We were also impressed by the rotary cutter’s ability to cut through thick fabrics, including the ones thick enough to give a lockstitch sewing machine a hard time (as it’s often not as powerful). 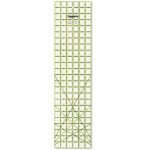 We also have an Omnigrid ruler rack on our list, which is the perfect option for those that are using Omnigrid rulers, which are also some of the best quilting rulers you can find (if you have the budget for them). Don’t let the pictures of this product fool you into thinking that’s it’s only designed to store a square ruler for quilting; it can hold rulers of all sizes and shapes. In other words, no matter what quilting square ruler sizes your ruler comes in, the Omnigrid WRR will be able to hold it securely and an in organized way to let you find it as soon as you need it, without having to waste any time searching for it among your other quilting stuff like pre-cut quilt squares and quilting stencils and templates. While it might not seem like a big deal, you would be surprised at what kind of difference it makes to your sewing room. There will be so much less mess, and sewers and quilters love how organized it helps them be. Despite this ruler rack appearing to be nothing exceptional in the pictures, it can easily hold multitudes of quilters square rulers in place. It doesn’t matter if you use a quilting square ruler or the usual quilters ruler, this rack would have no problem holding it in an organized way just as well. The rack itself is durable and made using quality hardwood. Sure, it does take up some surface space, but if you don’t mind it, it can be a great addition to your sewing setup. It allows a quilter to be much more organized, which is something they can really do with. It also makes you very efficient by saving a lot of your time, which would otherwise be spent searching through different rulers. This Omnigrip rule is very versatile, and can handle different types of quilting, sewing and even crafting projects with ease. It’s also one of the best rulers for rotary cutting, thanks to its accuracy and durability. In addition, something that sets it apart from the cheaper options is its detailed and easy-to-read numbering system and the uniquely designed angle system. 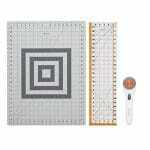 This allows it to offer considerably more value to your quilting projects than the typical quilting ruler does. Similarly, it also comes with a clear background, making it easy for you to read the measurements, which is how it manages to be impressively accurate. In fact, one of the customers that bought it tells in their review that it’s much more than a ruler; it’s more of a super useful quilting tool. And that’s because it makes it so easy to assess the accuracy of different patterns (or their cuts), as well as cutting them to make them exactly how they need to be. 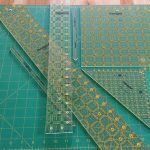 If you haven’t been using a fabric ruler or using a cheap cutting ruler, you will be surprised at how much fabric it would help you save that you were otherwise wasting due to poor cuts. While it’s priced a bit on the higher side, if you work on different projects that call for careful measurements, it’s going to be worth every penny. After all, there’s a reason it has managed to get almost universally positive ratings. Apart from the fact that it’s not a quilting ruler square (which can sometimes limit its ability to be used for different projects), the unique numbering and angle system is something that really pleased us. We also like how it’s perfectly transparent to pave the way for extremely accurate cuts, and finds itself being used as more of a tool than just another ruler. 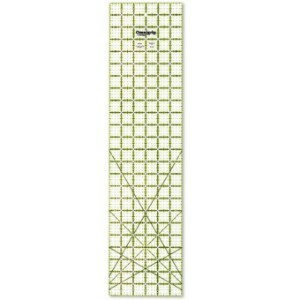 Yes, we also have a triangle quilt ruler on our list. 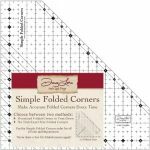 While the other rulers we have reviewed in this post may work just fine for most people, there are certain quilting projects that would get much easier to work with one of the triangle quilting rulers. Of course, it makes making triangles a breeze. If they are something you find yourself making very often, you would absolutely love the black line for ¼ seam on it. It’s actually more versatile than most people would think given its triangular shape. However, you will need to figure out all the directions to be able to use it the right way. Some customers complain of giving up on it as they find it confusing, which it can definitely be if you don’t know how to use it. However, once you learn the different ways it can be used in, it will speed up your projects quite a bit, and help you save a lot of time while getting very accurate results. It’s one of the best acrylic rulers for quilting, and is priced fairly affordably for a high quality triangle quilting ruler. While the triangle shape definitely makes it unique and particularly useful for some specific types of quilting projects, it can also be a great replacement for something that involves die cutting. 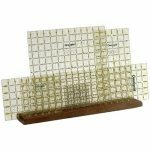 It allows you to make blocks that are of different sizes, with the clear, detailed markings helping get the accuracy you need for your quilting projects. We take different factors into consideration. While things like the sewing machine you use doesn’t matter much here, the type of fabrics you tend to work on can be important to consider. If you have read our sewing help guide, you probably have an idea of the huge variety sewing and quilting fabrics come in. Similarly, we also consider if a particular ruler offers measurements and numbering that’s detailed and easy to understand, as this is imperative to getting accurate results. And to ensure this, we chose the top non slip quilting rulers on the market that are transparent, allow you to stay on top of the measurements easily while you’re cutting, and thus help achieve a far better level of accuracy than you would get using cheaper products. As for ruler grips, one of the most important factors we consider is how well it holds the ruler in place, which, in turn, helps ensure a much higher level of accuracy. Similarly, we also think that it’s important for a ruler grip to be transparent enough to not block the measurements of the ruler. One of the reasons even a great Brother sewing machine won’t be able to make the final project as good as you would like is using a piece of fabric that hasn’t been cut using perfect measurements. If the ruler grip you’re using isn’t as transparent as it should be, it will be a struggle for you to work without getting annoyed with the incorrect measurements and wasted fabric, even if you’re sitting on a comfortable sewing chair and with the air purifier being on. Finally, we also choose ruler racks that are great at keeping things organized and are just as durable as a premium Janome sewing machine. We have discussed and reviewed multiple products in this post. We have walked you through some of the best rulers, ruler grips and ruler racks on the market. Coming to the different types, rulers do come in a few different types, such as the rectangular rulers, square-shaped rulers and even triangle rulers, one of which we reviewed in this post. Of course, their functionality do differ from one another, but the good ones are usually versatile enough to be used for a wide range of quilting and even sewing projects, such as resize sewing pattern projects and making a zigzag stitch. While using a good mechanical sewing machine may help when working on such projects, the right type of ruler can often turn out to be just as important. The ruler grips are used for holding the ruler in place when you’re using it, and there aren’t really different types for them. However, their ability to keep the ruler exactly where you need it to be does vary, but we choose the ones that have gotten great reviews from their customers and get the job done very efficiently. The same goes for ruler racks as well; there aren’t different types, but the quality may vary quite a bit. It’s the same as like choosing a computerized sewing machine; while it’s not that each of the different machines come with vastly different features, but the quality and durability can vary a lot. Why You Need the Best Ruler/Ruler Grip/Ruler Rack for Quilting? Let’s face it. Quilting can be pretty challenging, especially for beginners that have just been introduced to “real” quilting projects. And it doesn’t matter if you have got the best Juki sewing machine on the market, as that won’t make it any easier. The thing is, most quilting beginners may need to understand different types of products, such as quilting batting, among others. Even going with the wrong quilting notions can make the project a lot less appealing. The same goes for other products like quilting frames and quilting hoops. And, getting to our point, the rulers, ruler grips and ruler racks are no different. Unless you got a great ruler for quilting, you will have a hard time taking the right measurements, which can make all the difference when it comes to the accuracy of your project. The ruler grips are just as important, as they help hold the ruler for you exactly where you need it to be when taking measurements and cutting the fabric. If the ruler isn’t holding in place properly, you will again end up running into accuracy issues. Now, we understand that the best ruler rack may not seem like a necessity for a quilting project, just like a chainstitch sewing machine may not seem to be a must for specific sewing projects that involve chainstitching. However, without a good ruler rack, working on a big quilting project can cause a lot of mess. On the other hand, a ruler rack will help you stay organized and save a lot of time as you will find the rulers you need without having to waste time searching for them every now and then.